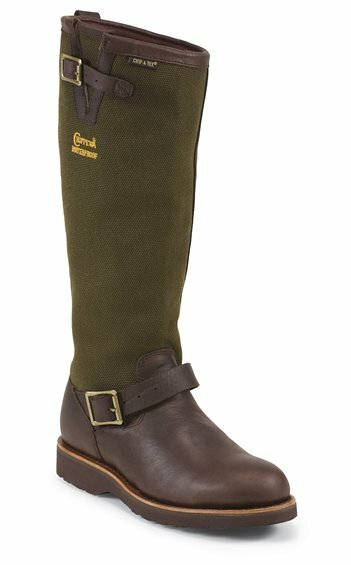 The Brome is a 17-inch tall men's boot with a waterproof olive green woven upper and golden brown leather vamp and collar. It features a Chip-A-Tex® waterproof membrane system that's breathable and locks water out of the boot by the membrane shield but allows air to pass through from the foot for maximum comfort. It provides maximum protection by combining thickness of leather and lining in order to withstand the strikes of venomous snakes. It has Bontex® insoles that provide a flexible and comfortable fit and allows for freedom of movement on the trail and a steel shank for stability. The Vibram® outsole offers traction on wet and dry surfaces as well as various terrain so you can feel safe and comfortable no matter where you go. These are extremely comfortable and you can wade fish in them; NO LEAKS !!!! The comfort will shock you first time you pull them on. No break in needed. These are the real deal!!! You will not regret buying them. Very comfortable. Second pair, highly recommend. Great boots. I had a pair and them bought the waterproof pair. Excellent choice. I am a returning customer when it comes to the Chippewa boots. I purchased a pair of regular snakeproof almost 5 years ago, I wear these boots everyday for work in brushy snake areas in south Texas. They are great for hunting and around fishing ponds, rivers and lakes. I recently purchased my second pair of Chippwa waterproof snake boots and they're very durable and comfortable. I like the flat heal when I'm standing or walking all day. The flat sole gives you more traction when climbing steep grades. I highly recommend Chippwa boots, you never know they might pay for themselves after the first snake bite happens. Just bought them. Very comfortable, snug fit around foot and calf. Just enough room to slip boot on and off and walk and not flop. Might be too tight fit for big calves. I also was looking for waterproof boots. Wish they made these in all leather that were waterproof. Also agree on wishing they had a more aggressive tread but like that these can be re-soled. The only boot to last me more than a year. Three years and still going. I've had them all rocky,lacrosse,Irish setter,cabelas,red head and so on. Nothing compares!